Claude loves clouds, and he dreams one day of seeing a Cloud Man. Cloud Men are very rare, very shy and very, very hard to find. 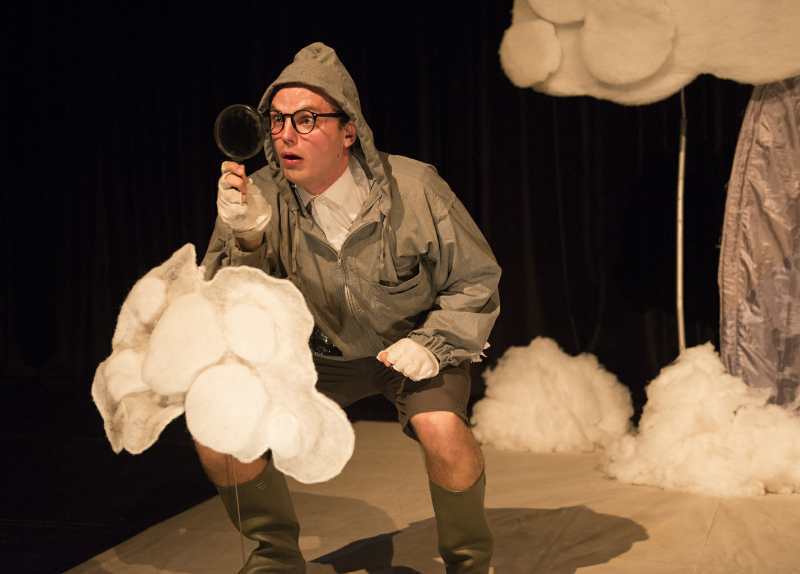 Sitting on little cloud cushions, the audience watch Claude as he follows clues which lead him to the top of Cloud Mountain, where they will find a big surprise! 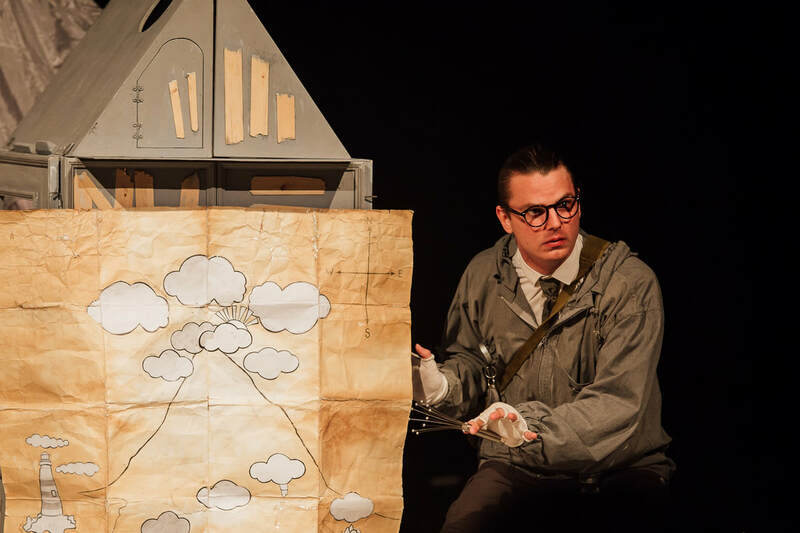 A cleverly staged show with puppets, storytelling and lots of clouds, the show explores the ways we try and make sense of the world and encourages the audience to notice the beauty and wonder to be found in everyday life. Teachers and children will enjoy the performance without prior knowledge of the story but the information packs below help teachers prepare and link to classroom plans. For two short films to show your class to prepare your class for a theatre experience in the school hall, one for you and one to show them, please see the RESOURCES section of our website. The children sit on cushions to watch the performance. There are some moments of audience interaction between the performer and children. So he decides to move to Cloud Mountain, the cloudiest mountain in the world, and live alone in a tiny hut, conducting experiments and looking for clues. For years and years and years... he remains optimistic that one day he’ll get to meet a Cloud Man. One day, when he is out on a trip to get supplies, a Cloud Man comes to visit! He sneaks into his tiny hut and has a good look around. He rummages in his cupboards, explores his experiments and finds all of his things that Claude has found and put in specimen jars. Then he finds his biscuits! And he is delighted because he loves biscuits. Claude comes home, and the Cloud Man hides. He notices that things are out of place, and it all seems very strange indeed. He carefully pieces together the journey he has gone on by following the trail of disruption. Eventually, he finds him! He cannot believe it! All his life he has waited for this moment. He is very quiet and shy, but he is very polite. He sees that he has been eating biscuits, so he gives him another one. He is very happy about that! He makes a sculpture out of cloud and gives it to Claude as a gift. He makes a little bow and starts to leave. Claude is taken aback, he can’t leave so soon, he’s been waiting for so long! He pleads with him to stay, but he just goes to leave. He has an idea. He gets the biscuit jar and says ‘look, you can come and have all the biscuits you want!’ The Cloud Man is excited. He trots along and runs head first into the jar, and Claude quickly puts the lid on. He has trapped him! The Cloud Man is shocked. Claude tries to explain, he’ll look after him, give him biscuits and warm milk. He’ll make him a lovely comfy bed. He is very worried and tries to get out of the jar. He decides to ignore him ‘til he’s calmer and make some scientific observations, but the Cloud Man seems to get more and more upset. Claude has waited all this time to find a Cloud Man and now he has one, but he just keeps looking up at the clouds overhead... Claude has to make a decision. The Cloud Man scurries back to his Cloud. And he let Claude see inside, which was more wonderful and complicated than he could have imagined. He sees all the different parts of the Cloud, where the rain is made, where the snow is made, where the sunshine catches, and he sees the Cloud Man playing. And Claude is happy knowing that he is happy. And when still to this day, if he’s lucky, that same Cloud Man comes back to visit and waves down from his cloud as he drifts slowly past in the sky. Science: the natural world, observation and experimentation, Respecting ecosystems and environments. Themes: Independent learning, care and respect for other living things, patience and diligence, the rewards of putting another beings welfare above your own, kindness, curiosity. Ailie Cohen Puppet Maker is the collaboration between Ailie Cohen and Playwright and Director Lewis Hetherington. Ailie is a puppeteer, performer, illustrator, designer and puppetry director creating emotionally rich and compelling theatrical experiences which highlight the beauty and surreal in the everyday. Ailie and Lewis bonded over a love of creating theatre that uses objects, puppets and pictures to tell beautiful original stories which engage with the world we live in, and are full of heart, fun and magic. They make work which is an invitation into fantastic and colourful story worlds which celebrate the extraordinary nature of the ordinary. Combining minimal, poetic text, a sumptuous handcrafted aesthetic and engaging characters they make work which lasts long in the imagination and memories of those who see it. Together they have created 'Cloud Man' and 'The Secret Life of Suitcases'. Both productions have been presented as part of the Made in Scotland showcase. Their work has travelled all over the world, delighting audiences in China, Dubai, Japan, America, Australia and extensively throughout the in the UK. Ailie is a puppeteer, performer, illustrator, designer and puppetry director for among others, National Theatre of Scotland, Grid Iron, TAG, The Citizens and Vanishing Point. Her own shows include 'I Vant to be Alone’, Rumpelstiltskin at the Fairytale Laundry', ‘Jazz Mouse’, 'The New Not New'. Ailie is an associate artist of Puppet State Theatre Company, with which she collaborated on ‘The Man Who Planted Trees’, and has toured worldwide since 2006. Ailie has also worked for National Theatre of Scotland; Imaginate; and was co-deviser, performer, puppet and props maker for National Theatre London’s ‘Cupboard of Surprises’ Inside Out Festival 2012 which was part of the London 2012 Cultural Olympiad. Lewis is a Glasgow based Playwright and Theatre Maker. As associate of the award-winning Analogue he co-wrote Mile End and Beachy Head, and wrote Fringe First winningﾠ2401 Objects. With Catrin Evans he wrote and directed Leaving Planet Earth for Grid Iron, which premiered at the Edinburgh International Festival. Writing credits include Khamsah for National Youth Theatre, presented in Saudi Arabia, Friends Electric for Visible Fictions, Tin Forest; South West for National Theatre Scotland, A Perfect Child for A Play A Pie and A Pint at Oran Mor, Rebecca’s Midnight for Lyra Theatre, Red Riding Hood, Goldilocks for Platform, Cloud Man created with Ailie Cohen. Lewis’ work has been produced throughout the UK and internationally. His work is published by Oberon.